I had been painting for about 5 years when my gallery in Melbourne called me to let me know that a scout for a Japanese gallery had been in to see them and were very interested in showing my artwork in Nagoya. 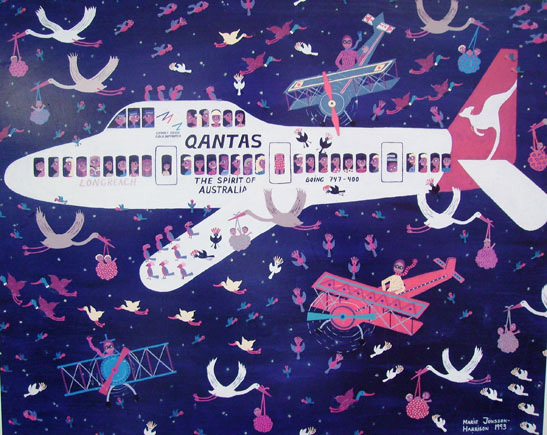 This painting depicts my Qantas flight over to Nagoya in Japan for my first exhibition, however there was a lot of I’s to be dotted and t’s to be crossed before that first trip. You see the Japanese do not do things by half and it took more than six months before that first contract was signed. Heading off to Nagoya, Japan for my first art exhibition there! So in the meantime I lived on hope, as during both my days as a model and then in the art business I have come to know that you win some and you lose some, and I didn’t know which category this was going to fall into. Firstly I had to send pictures of my artwork to Japan, price lists, mediums and sizes etc, and then they wanted to see some of the actual paintings in real life so a couple of paintings had to be sent over to Nagoya. Then there was lots of to-ing and fro-ing about the price I was to receive for each art work and the commission for the art gallery in Melbourne. Eventually a representative from the gallery in Japan flew to Melbourne and they flew me from Adelaide for the final meeting and signing of the contract, which was held at the Melbourne gallery who were my agent in this new art venture. I took one of my dearest friends Christina with me as well as my two kids, Kai and Hillivi. So off we go; Miss Hillivi my daughter was 2 years old at the time and had just sat down in her seat on the plane and fastened the seatbelt before she threw up all over herself, (there are quite a few stories like that with little Miss Hillivi) luckily I had Christina there to help me out. I do know that first impressions are really important and thought my chances with the Japanese would not be enhanced by being covered in baby spew, so by now I was getting a bit worried. The problem was we had to go virtually straight from the plane to the Japanese meeting, as typically the plane was delayed. However as one door closes another one opened and I ran into an acquaintance on the plane that said we should come to his hotel and get changed. Saved by the man on a white horse so to speak as both I and Hillivi did not smell so good by this stage(brave man), so that offer came in very handy. We eventually found a taxi driver to take us (although we had to duck in the backseat all the way) and surprisingly enough still made it to the meeting on time. Christina, bless her cotton socks amused the kids in a café down the road whilst I against all odds and with nothing left but hope finally had that contract signed and sealed. So here is a saying from Lu Xun (writer) that I think fits rather well here.